Channa Upuli dancers performing at the IMF. Dancer and dummer from Channa Upuli dance troupe perform traditional dance during an appearance at the International Monetary Fund headquarters in Washington, D.C.
Sri Lanka maestro and vocalist Jananath Warakagoda (left) and fusion violinist Ruwaran Weerasekere collaborate on a jazz piece during an appeareance of Sri Lankan artists at the IMF. IMF Managing Director Dominique Strauss-Khan (second from left) and Min Zhu, special advisor to the managing director (left), enjoy a performance of traditional Sri Lankan music at the IMF. 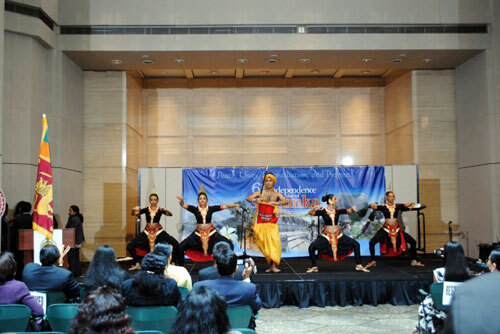 Several of Sri Lanka’s most renowned artists, including the dance troupe Channa Upuli, today staged a performance of traditional dance and music at the International Monetary Fund’s Washington, D.C., headquarters. The performance was arranged by the Embassy of Sri Lanka in Washington, coordinated by the IMF’s Office of the Indian Executive Director, with the assistance of Dr. P.N. Weerasinghe, Sri Lanka alternate executive director to the IMF. Besides the Channa Upuli dancers, drum maestro and vocalist Jananath Warakagoda and fusion violinist Ruwaran Weerasekere also performed on the atrium stage of the IMF Headquarter’s building. The performance was attended by Mr. Dominique Strauss-Khan, the IMF’s managing director, Mr. Min Shu, special advisor to the managing director, and Jaliya Wickramasuriya, Sri Lanka’s Ambassador to the United States. 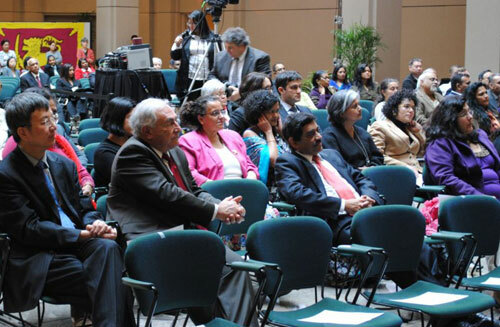 Staff members of the IMF and World Bank senior staff also attended. Guests enjoyed a selection of Ceylon teas. Channa Upuli performed previously at the IMF, dancing on the same stage in 2009 following Sri Lankan Independence Day celebrations in Washington. 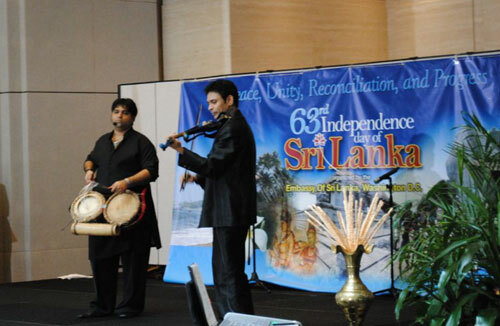 The Feb. 7, 2011 performance coincided with the embassy’s celebration of Sri Lanka’s 63rd year of independence. The artists traveled to Washington from Sri Lanka to take part in the embassy’s Feb. 5 Sri Lankan community Independence Day celebration.